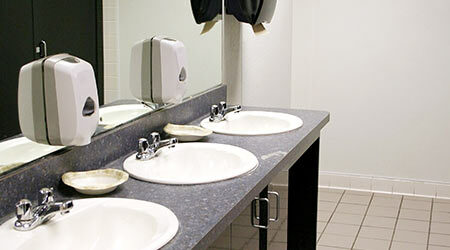 If restroom fixtures are broken or outdated, building occupants are often going to assume that it’s the building service contractor falling down on the job, whether they’re responsible of not. With that in mind, contractors should be sure to spell out who is responsible for the purchase and maintenance of fixtures. If janitors are responsible for maintaining them, did they think of everything? Charles “Mickey” Crowe mentions an instance in which the paper towel dispensers weren’t working properly. He waved his hand under the no-touch sensor and nothing happened. When he tried to operate it manually he realized that the cutter was mechanized as well and pulled out almost five feet of toweling while trying to figure out how to make it work. If a contractor isn’t responsible for the fixtures, but they’re bringing down either the quality or the speed of service, then its time to have conversation with the client and offer replacement suggestions. BSC need to show the property manager that if the facility has the right size and type of dispensers, things will run much more smoothly. Explain how many times janitors are getting notified that supplies are low. Document how much time it takes for janitors to refill the dispensers multiple times a day or even a week versus if they only have to refill them periodically. Caryn Gracey Jones is a freelance writer based in Aurora, Colorado.